Murphy and I are back out on the trail with the Canon 5D Mark II – Art In The Park. I love these urban sculptures. 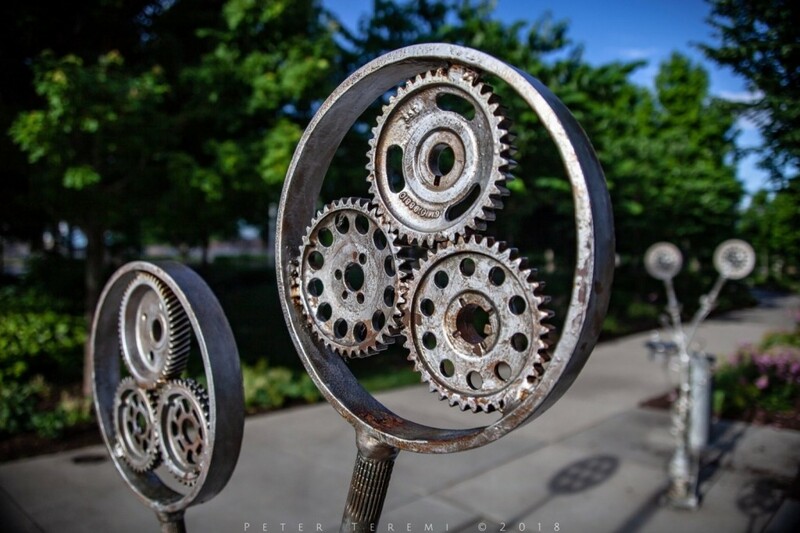 Taking something that has been discarded, and focusing them through the hands of an artist to create a unique expression, adds beauty and interest to our downtown parks. Shallow depth of field is what I am after for this trio. There is nice separation of the primary subject from its counterparts which are at varying distances behind it. The lighting is great during the early morning providing a saturated color bed without being harsh. We hope you enjoy these! If you haven’t been down to Smale Park or any of the riverfront parks recently, you owe it to yourself to come down, go for a walk, have a bite to eat, take in a game, or just sit and watch the boats. I am having a lot of fun with this camera, and look forward to the next installment in the series. Thank you for viewing these. Thoughts and comments are welcome and appreciated. As always, Murphy and I wish you a fabulous TGIF from The Murphy-Cam Project!